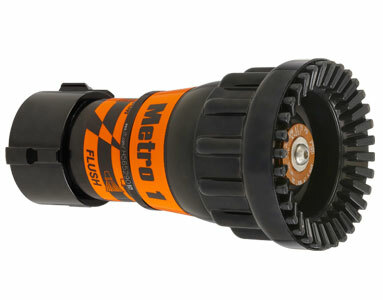 METRO 1 TIP 1.5" NH (38mm) Fixed gallonage tip with 14 flow / pressure choices and flush without shutting down. Lightweight hardcoat anodized aluminum for maximum resistance to corrosion and wear. Tip does not shut off and must be used with a separate valve or valved playpipe. 1.5" NH (38mm) rigid rocker lug coupling is standard. 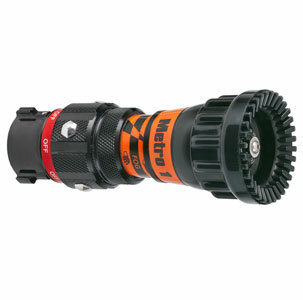 METRO 1 TIP/TWIST-OFF 1.5" NH (38mm) Fixed gallonage nozzle with 14 flow and pressure choices. Includes patented twist slide-type valve for turbulence-free flow control, flush without shutting down, and "Gasket Grabber" inlet screen. Lightweight hardcoat anodized aluminum for maximum resistance to corrosion and wear. May be used with a separate valve or playpipe. Ideal for break-and-extend operations. 1.5" NH (38mm) rigid rocker lug coupling is standard. METRO 1 NOZZLE 1.5" NH (38mm) Fixed gallonage nozzle with 14 flow and pressure choices. 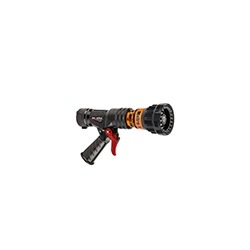 Includes flush without shutting down, patented slide-type valve for turbulence-free flow control, six detent flow positions, and "Gasket Grabber" inlet screen. Lightweight hardcoat anodized aluminum for maximum resistance to corrosion and wear. 1.5" NH (38mm) full-time swivel rocker lug coupling is standard. 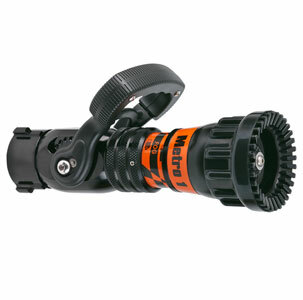 METRO 1 W/GRIP1.5" NH (38mm) Fixed gallonage nozzle with 14 flow and pressure choices. Includes flush without shutting down, patented slide-type valve for turbulence-free flow control, six detent flow positions, and "Gasket Grabber" inlet screen. Lightweight hardcoat anodized aluminum for maximum resistance to corrosion and wear. Pistol grip is mounted below the valve. 1.5" NH (38mm) full-time swivel rocker lug coupling is standard. METRO 1 W/TRIG 1.5"FEMALE WITH STANDARD FLOW WASHERS METRO 1 With Impulse™ Trigger Valve System - Fixed gallonage nozzle with 14 flow and pressure choices. Delivered with the 200 gpm @ 75 psi (760 l/min @ 5 bar) calibrated flow disc installed. The Metro 1 features flush without shutting down, your choice of molded rubber bumper with "power fog" teeth or stainless steel spinning teeth, "Gasket Grabber" inlet screen, trigger operated slide valve, and the rugged dependability you have come to expect from Task Force Tips. The Metro 1 Impulse has optional colored pistol grips available (NFPA 1901 (A.16.9.1). 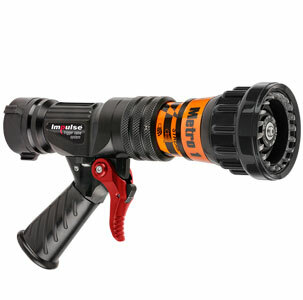 The Metro 1 Impulse accepts the FJ-HM, FJ-LX-HM low-expansion or FJ-MX-HM multi-expansion foam attachments.